UPS cable connectors and fuses. This article explains the differences among UPS cable connectors, lugs and fuses -exciting stuff. This information applies to multiple UPS units: APC, Tripplite, Cyberpower, Eaton. etc. Ever wonder why some UPS cables use grey connectors while others use blue connectors? Ever wonder if those cables or battery packs are compatible? UPS units use plastic SB connector assemblies (e.g., Anderson housing) to safely connect insulated battery cables. Figure 1. UPS connector and contacts. Figure 2. UPS AWG 1/0 Cable. UPS connectors have mechanical keys that are based on color (Table 1). This color system prevents accidental voltage mismatch. N.B., voltage mismatch is bad. For example, 24V UPS units use grey connectors. Grey connectors only connect to other grey connectors. Likewise, 48V UPS units use blue connectors. Connector keys and color are the only difference between grey and blue UPS connectors. 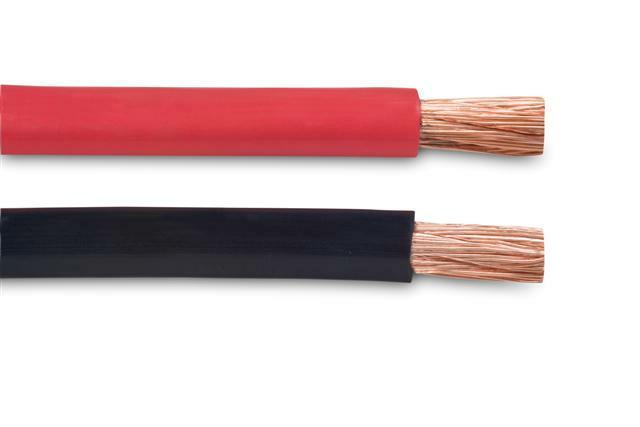 Both assemblies can pass 175 Amps with 1/0 AWG cable. Now consider the wide compatibility among different UPS units and battery packs. Any crimp tool rated for 0 AWG cable. Solder provides better pullout strength. Some connectors have solder pre-applied -just heat it up! Use a SB extraction tool (e.g., SBX175 969P1) to pop the assemble open. Insert the extraction tool between the contact and housing. It's just like to opening a bottle of beer. Fig. 3. UPS connector extraction tool. FLD (i.e., smaller) 100A bolt-mount fuse for 9/16" bolt terminals. Generally found inside UPS with two batteries. 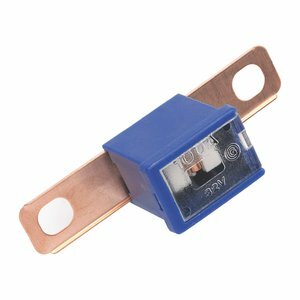 FLB (i.e., larger) 100A bolt mount fuse for 13/16" bolt terminals. Generally connects four batteries (e.g., battery pack). Figure 4. FLB or FLD fuses for UPS units. It's hard to mess up replacing a UPS fuse. The smaller FLD fuse will not fit into the larger fuse block (i.e. FLB). Likewise, the larger FLB fuse will not fit into smaller fuse blocks (i.e., FLD). Also, please disconnect connectors and cables from the power source(s) when working with the UPS (e.g., batteries, fuses, etc).